Disposable disinfecting wipes made from nonwoven synthetic fibers are popular because they are convenient and effective. The wipes are soaked in a solution that contains germ-killing compounds called "quats." The quats release readily from the synthetic-fiber wipes, but those fibers decompose slowly in landfills. While cotton and other cellulose-based fibers are biodegradable, quats do not readily release from them. 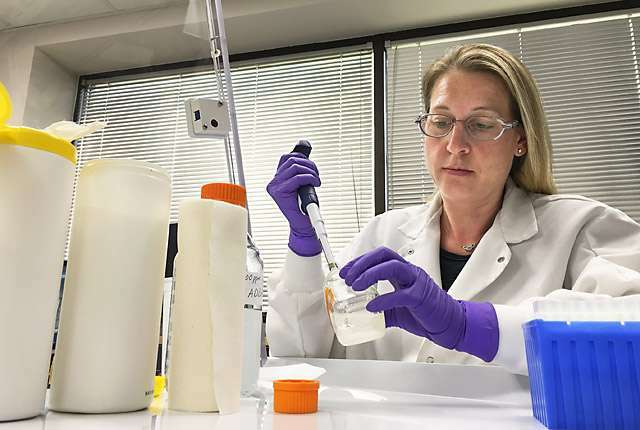 Agricultural Research Service scientists have discovered new chemical formulations that allow quats to release from nonwoven cotton, resulting in hospital-grade disinfecting cotton wipes that are both effective and biodegradable. Traditionally, raw, or greige, cotton is rigorously cleaned before being knitted or woven into textiles used to make clothing, sheets, and towels. 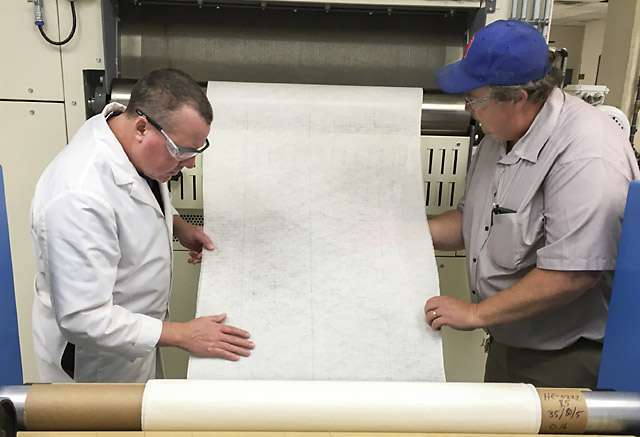 Newer fiber-entangling processes produce strong nonwoven cotton fabrics for use in other items—such as wipes. Because quats release readily from synthetic fibers like polyester and polypropylene, synthetics are the top choice for use in wipes. But when it comes to attributes such as absorbance, abrasiveness, and wet strength, cotton-based wipes are superior to synthetic-based wipes, says Hinchliffe. The ARS team worked with a quat commonly used to disinfect hard surfaces. The quat, called "ADBAC," is a stable, cost-effective active ingredient widely used in commercially available synthetic-based disposable disinfecting wipes. The team found that ADBAC adhered so strongly to the surface of cotton fibers that it failed to release in amounts sufficient to disinfect hard surfaces. The ARS team developed new chemical formulas that block quats from adhering strongly to the surface of cotton fibers in disposable wipes. The result is a cotton wipe that releases quats for surface disinfection and that is also strong, abrasive, and fully biodegradable. The researchers tested wipes made from 100-percent greige cotton soaked in the new ADBAC formula and compared them to control wipes soaked in regular ADBAC. "We chose four specific microorganisms to test the wipes against, because they are of great concern in clinical environments such as hospitals," says Hinchliffe. The wipe containing the new ADBAC killed all four microorganisms, including two that the control wipe did not. The new wipe also killed MRSA (methicillin-resistant Staphylococcus aureus) and VRE (vancomycin-resistant Enterococcus). The efficacy tests were conducted using Good Laboratory Practice (GLP) standards that are required for Environmental Protection Agency registration of new disinfecting products. Compliance with GLP standards allows cotton wipes that successfully sanitize surfaces against specific microorganisms to be certified as disinfectants. Adopters of the new technology will conduct further testing to broaden the list of microorganisms the wipes can disinfect. Can we 'wipe out' MRSA?